Idahoan Premium Homestyle Mashed Potatoes, 28 Ounce - 12 per case. View More In Potato Side Dishes. If you have any questions about this product by Idahoan, contact us by completing and submitting the form below. If you are looking for a specif part number, please include it with your message. 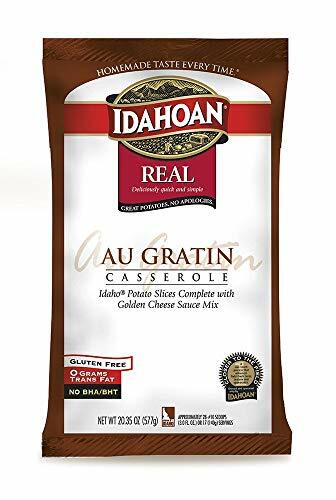 Idahoan Real Au Gratin Casserole Potatoes, 20.35 Ounce - 12 per case. Idahoan Real Mashed Potatoes with Vitamin C, 26 Ounce - 12 per case. Idaho Supreme Mashed Potato Granules with Vitamin C, 6 Pound - 6 per case. Idahoan Steakhouse Baby Reds Mashed Potato, 20.2 Ounce - 12 per case. Idahoan Scratch Mashed Potato Extender, 19.79 Ounce - 12 per case. Idahoan Buttery Golden Selects Mashed Potatoes, 32.5 Ounce - 8 per case.